A massive protest has gathered in front of PM David Cameron’s residence at 10 Downing Street, calling for his resignation. 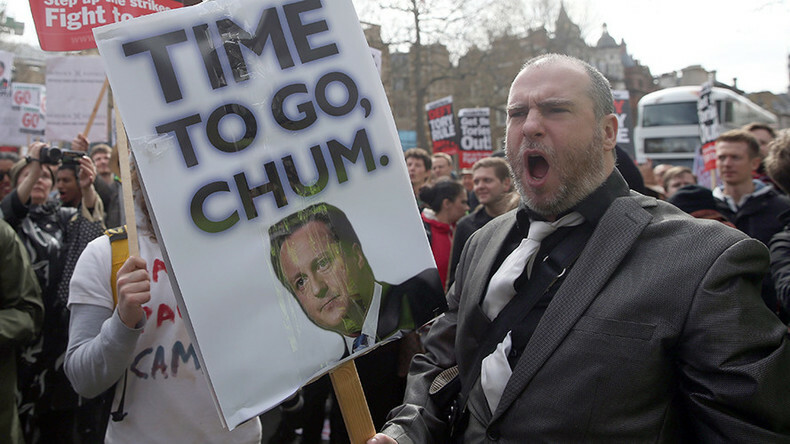 The rally follows the so-called Panama Papers leak, which among others exposed the offshore dealings of Cameron’s late father. The #ResignCameron rally then moved on to Trafalgar Square, where thousands of people joined in the call for the prime minister to go. Meanwhile, Ruptly’s Jon Scammell tweeted that there had been clashes and arrests in Parliament Square as police shut down the protest. "The British will never protest," they said. Cameron said he sold the shares for around £30,000 (US$42,000) in 2010, four months before becoming PM. On Friday NSA whistleblower Edward Snowden urged the British people to demand Cameron’s resignation from government. The hashtag #ResignDavidCameron has been trending on Twitter.